Everyone knows that before a ski holiday, we all dread the burning thighs and aching muscles but there’re a few things that you can do during the off season that will make sure that doesn’t happen! The ideal way to do this is to NOT HAVE AN OFF SEASON. Why not spend your summer traveling to somewhere in a different hemisphere and have a full 12 months of skiing? You could be shredding powder with the best of them, not worrying about aching muscles. Doesn’t that sound like a dream? Very warm greetings from my cold, white world in Steamboat, Colorado! We’ve had 23cm of new snow in the last 24 hours, and we already have a 61cm settled snow base at mid-mountain at the top of the Gondola. I also see snowy days and/or cold days in the 10-day forecast, and although I would not dare second guess Mother Nature, all signs indicate an amazing Steamboat opening day on November 24. 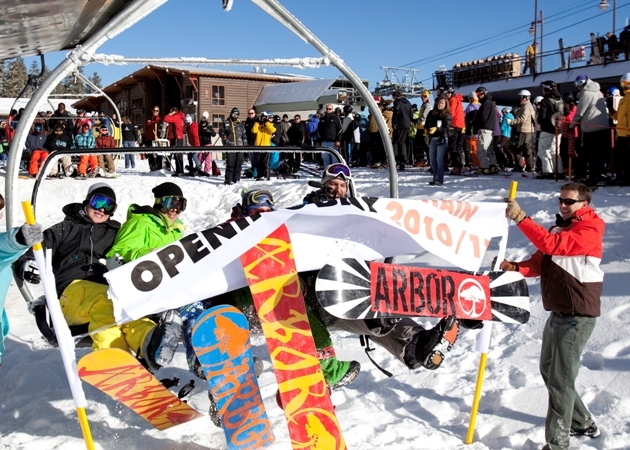 The Colorado Super Chair on Peak 8 was running, as was Chair 5, carrying loads of happy skiers and snowboarders up to the more than 290 skiable acres that were open, including hike-to terrain on the Horseshoe and Contest Bowls! Today also marked the debut of the Gold Runner Coaster on Peak 8. There was a ribbon cutting ceremony and several eager riders of all ages waiting for their turn to experience the new thrill ride. Possibly the luckiest guy this season? We had a heated argument in the pub the other night about the top 5 epic expert ski runs in North America. The debate was fierce – what makes a ski run ‘epic’ – pitch, scale, snow, exposure, elevation, scary terrain features, fear factor, what? Pitch can be conquered with bullet-proof technique. Scale means stamina. Runs always change their character in different snow conditions, weather, light and time of day. Exposure makes you feel alive. Elevation – no pain, no gain. Scary terrain features? I laugh in the face of ‘mandatory air’! Fear factor – beats the crap out of the X-factor. What should be included, and what criteria should we use? Does Snowbird have better terrain than Kicking Horse? Is the snow depth and quality in Fernie better than Crested Butte? Who can say, but in my opinion a truly epic ski run needs five qualities – (1) a degree of difficulty that keeps you thinking and working hard the whole way down. (2) a fear factor. (3) a tick-the-box factor. (4) an aura. (5) a scale that’s off the dial.